We offer your business or organization the ability to Show Off to the world who you are. Whether we use your design/logo or we design it for you, you can be assured that people will know who you are. Your logo can then be put on thousands of different items ranging from custom printed items to promotional apparel. Promotional items are a very effective way to market your business, organization, school or event. Show Off Sales uses only the best quality products for our custom embroidery or screen printing to ensure your product will last, unlike some items you can end up with when you shop on price alone. We also can do custom embroidery in-house for quantity's as little as one item! Our prices are very competitive and our quality makes us even a better value. What a great way to add your name or logo to your favorite garment or promotional product! 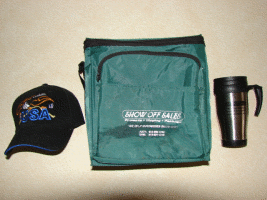 Show Off Sales is committed to outstanding service, whether you want 1 item or 1000 items. Our friendly staff is ready to answer your questions to ensure you get exactly what you want.